PEACHES! PEACHES! PEACHES! .... there is a plethora of peaches here in the south and the season is fast approaching its end as we head into the fall. 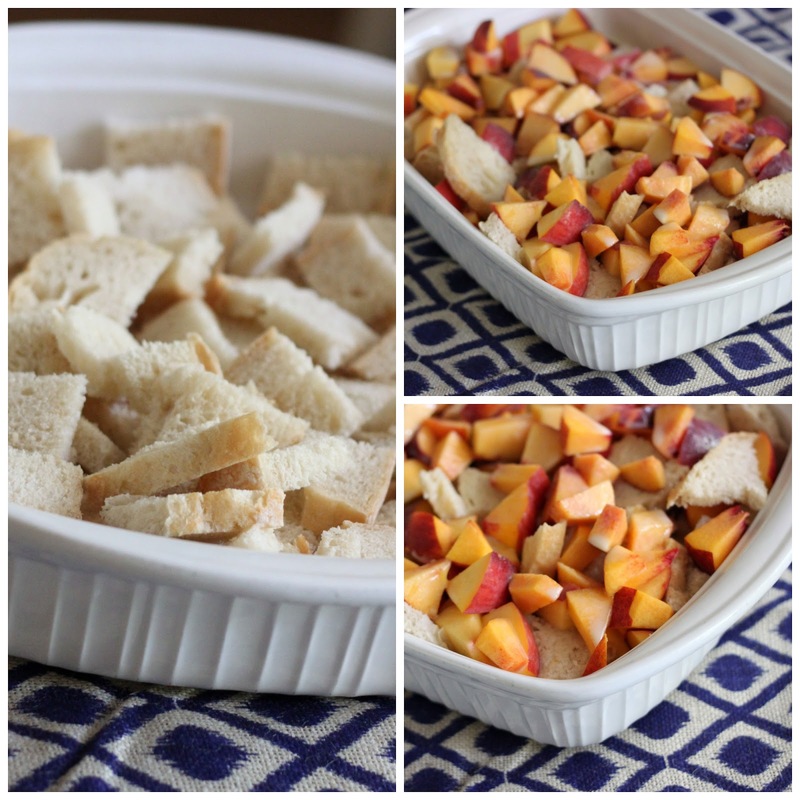 So when I ran across this recipe I knew this is what I wanted to do with these last weeks of peach season. It is not a time consuming recipe, but it does require setting aside some time due to the fact that is needs to set in the fridge for an hour. Butter a 9 by 13-inch pan. Place bread cubes and peaches in an even layer in the pan. Whisk buttermilk, sugar, vanilla, eggs and egg yolks. Pour over the bread and peaches. Let stand for about an hour in the fridge. Remove and let come to room temperature for about 30 minutes. Preheat oven to 325 degrees F. Bake for about 45 minutes or until set and top is golden brown. Remove from oven and let cool slightly before serving. 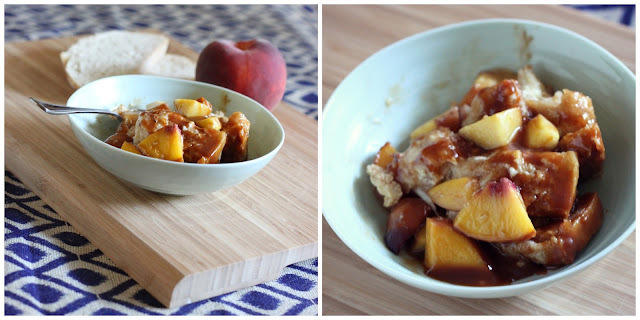 Spoon warm bread pudding into bowls and top with caramel sauce. Sprinkle the sugar in the bottom of a heavy-duty saucepan. Turn heat on to medium-high. The sugar will start to melt. Gently swirl the pan so the sugar melts evenly. When the sugar has all melted and is golden amber in color, remove from heat and immediately add the butter and cream. It will bubble furiously and then calm down. The caramel will probably clump up. Place the pan over medium heat and stir to melt the clumps. Add a pinch of sea salt and the vanilla extract. Pour into a glass jar or pitcher and keep warm until ready to serve. Cover the leftover sauce and refrigerate. Keeps well for 2 weeks.